Inducted into the AHL Hall of Fame in 2008, Steve Kraftcheck was known as one of the smartest and steadiest defensemen in league history and a perennial all-star. He finished his career with the Reds, retiring in 1964 as the AHL’s all-time leading scorer among defensemen with 453 career points, a standard that stood for more than 40 years. 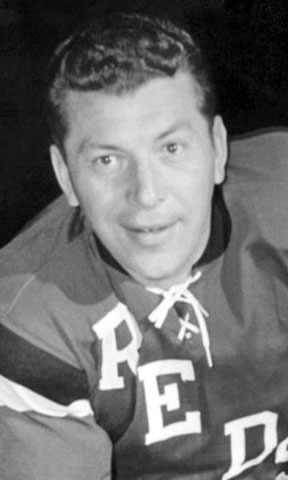 After two seasons in the NHL with the New York Rangers, Kraftcheck was traded to the Cleveland Barons in 1953 as part of a deal that sent goaltender Johnny Bower to Broadway. Back in Cleveland, Kraftcheck’s hard-hitting, rough-and-tumble style helped the club capture a Calder Cup championship in 1954. Kraftcheck joined the Rochester Americans in 1958-59 and captured the inaugural Eddie Shore Award as the AHL’s outstanding defenseman. A year later, he served as player/coach of the Amerks and led them to the Calder Cup finals. He played in five AHL all-star games in the 1950s and is one of three players in league history to have earned six consecutive nods to postseason all-star teams.